When a mortgage broker or analyst wakes up in the morning the first thing they do is take a shower, brush their teeth, then check the rate on the 10 year US treasury bond. As just discussed in the previous section, the 10 year bond is the epicenter of the financial universe and the US mortgage market provides the perfect example of why. Mortgage rates use the 10 year treasury bond as their baseline rate. 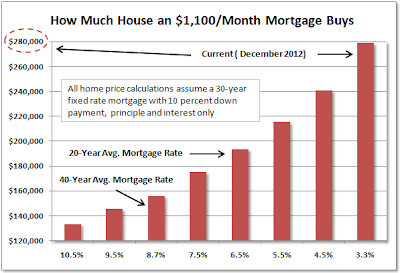 They then add a "spread" on top of this rate to determine what the homeowner will pay monthly. This spread is used to pay for the lender to service the loan and then provides the investor that ultimately purchases the debt their additional return for purchasing an asset that is not "risk free." Lately the difference between US treasury bonds and US mortgage bonds has become blurred. This is due to the fact that the government now purchases or insures over 95% of all mortgages today. 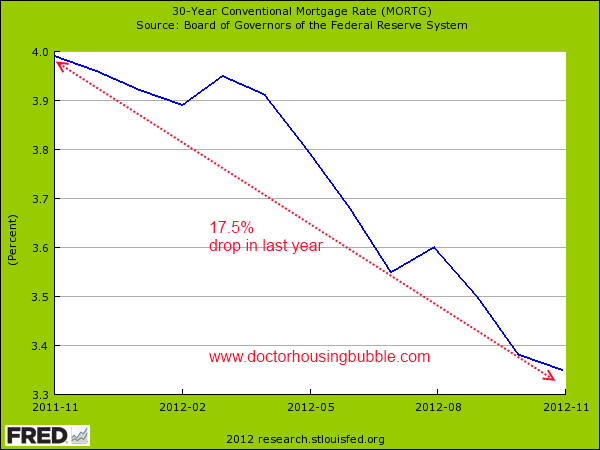 The government is the mortgage market. The following chart showing the dominance of government run Fannie, Freddie, and Ginnie does not include the VA (Veteran government program) or the government run Federal Housing Authority (FHA) which takes care of insuring the rest of the mortgages on the backs of the US tax payer. Behind this ridiculous government guarantee, investors know that the Federal Reserve has promised to purchase $40 billion of mortgage debt every month in their new QE-ternity program. This means that not only is the debt guaranteed by the government, if they ever want to flip the bonds at a higher price they can just offload them onto the Fed. This has set up a mortgage debt environment so toxic that it will make the original subprime crisis look like a warm up. 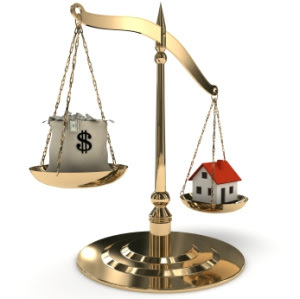 The losses mortgage debt holders will take are obvious when interest rates rise (rising bond rates = lower bond prices), however, in order to understand how the actual homeowners will be crushed as well we need to dig deeper. 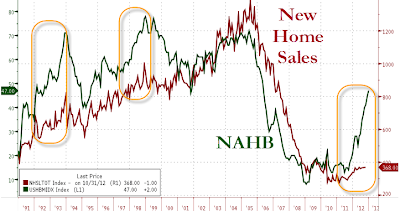 To do that I will refer back to a portion of a post from last month that tells a story of the new American homeowner caught up in the current housing bubble. Imagine that you are an average working American family and you decide it is time to purchase a home. The first thing you most likely do is figure out how much you can afford. That begins with a calculation of your monthly income to determine after taxes, other expenses, and what may be put away in the 401k, how much you have left for a mortgage payment every month. We'll say that this family, the Thompsons, determine that number to be $1,100 per month. I would guess this is very, very, close to the average number for middle class families in America (based on average income data). Now with this number they head down to the bank. They tell the bank they want to buy the maximum amount that $1,100 per month will allow. The bank representative opens up their calculator and writes down a number on a piece of paper. The Thompsons then call their real estate agent with this number in hand and start looking at homes. Let's pause for a moment to take a look at the most important and misunderstood piece of this entire process: the impact of mortgage rates on the number the bank representative writes down. The graph above from Iacono Research shows on a sliding scale how much they can pay for a home with an $1,100 mortgage payment. If mortgage rates were at 10.5% today the Thompsons could afford to pay $130,000 total for a home (all these estimate a 10% down payment). If mortgage rates are down at 3.3% (they are at 3.31% this week), the amount they could afford to pay for a home rises to $280,000. Let's now extrapolate this further because many people (including me) believe that mortgage rates have the ability to fall even further in the short term. If 30 year mortgage rates fell to 2.5% the home price would rise up to $310,000. If mortgage rates fell to 1.5% the home price would rise up to $350,000. Now let's move forward and see how this plays out. 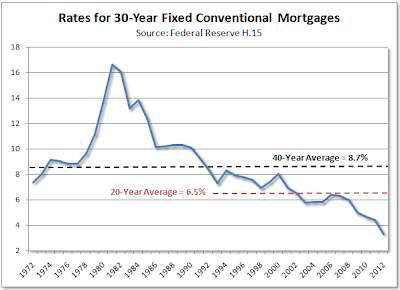 If the Federal Reserve and the government, which have nationalized the mortgage market, can artificially push rates down to 1.5%, imagine that the Thompsons had the opportunity to lock in at that rate. The Thompsons rush out to purchase their $350,000 home with only $1,100 per month in payments. They are feeling real good about themselves. Then they hear on the news that interest rates begin rising. "Who cares?" they say, they have already locked in at the low rates making them the smartest buyers on the block. Interest rates are now rising quickly, beginning to move back toward the normal historical rate between 7 - 10%. 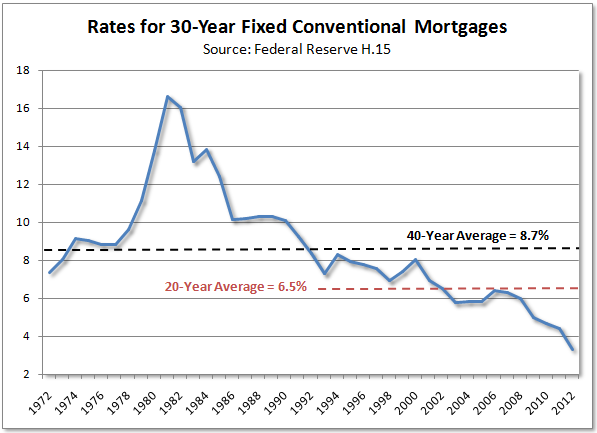 Rates stop at 4.5% (still historically very low) when the Fed announces they will purchase another round of mortgages. Two of Thompson's neighbors put their home on the market to cash in on their new $350,000 home price. Buyers show up to look at the home but they have some bad news. With interest rates now at 4.5% new buyers only have the ability to pay a maximum of $240,000. They like the home, they tell the sellers, but the only way they can afford the monthly payments would be if they dropped the price by $110,000. After talking to their neighbors the Thompsons have a sick feeling in their stomach. They realize that by locking in at the all time record lowest rates in history they have moved into a coffin. Every tick upward in interest rates means less buyers that can afford their home and a lower price. Does this help explain why buying at low interest rates is the worst possible time to purchase real estate? Especially when they are created artificially by the Federal Reserve.The Fed is doing everything in their power to create another artificial bubble. As soon as interest rates either stop going down, or (gasp) begin to rise, home prices will plunge. Without going into a full discussion on the subject, what do you think rising rates would do to the value of home builder stocks which are now priced for building levels during the 2001 super boom years. 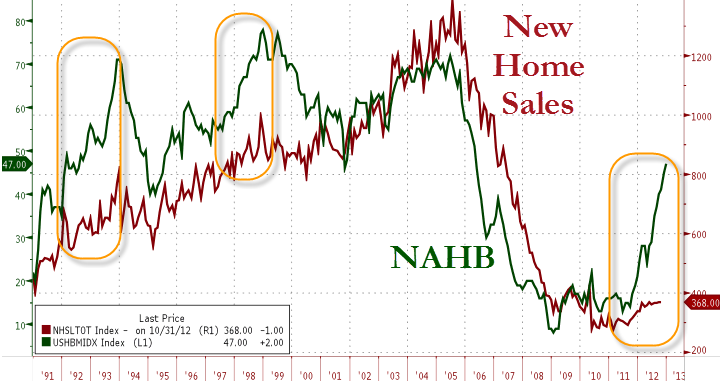 The green line shows the builder confidence index and the red line shows actual sales. What if interest rates rose and all those homes ended up not getting built? People say it is ridiculous to bet against housing because today it is a direct bet against the United States government. That is exactly my point. I am betting against the 10 year US treasury bond (the United States government), which means I will subsequently bet against (or avoid) the investment classes that will be impacted the most by the 10 year losing value. This does not mean I believe the US will default on its debt and the price on US bonds will go to zero. It only means I believe rates will be higher in 2014, 2015 and 2016 than they are today. If you can understand just what we have discussed so far and can now begin to extrapolate out into a future world with higher rates you will be miles ahead of everyone else around you. We're not going to stop at this point, however, because the story only gets more exciting from here. Let's now take this discussion into the realm of commercial real estate. Here we will start having fun with the big real estate numbers before we move on to the rest of the world. I enjoy reading your analysis however I disagree that the interest rates have such a direct effect on the prices of residential real estate. They are important of course but there are variables which can make the prices behave in the opposite way from what you are suggesting. In the 1970s, New York City was devastated by national and municipal economic crises. Rising crime, unemployment and poverty rates, coupled with a lack of social services, made many neighborhoods inhospitable. The City's population declined by more than 800,000 people, and many disadvantaged neighborhoods were littered with abandoned buildings. Between 1974, the first year for which we have sales price data, and 1980, housing sale prices declined by 12.4% citywide. After at least six years of decline, housing sale prices across the City soared from 1980 to 1989, increasing by 152%. Prices in 18 neighborhoods increased by more than 200%, and only one neighborhood saw prices grow by less than 100%. This boom ended as the nation entered a recession in 1989. The statistics above imply that an economic boom/recession has a stronger effect on the prices of real estate than does the interest rate. Consequently, the only way that your scenario can be validated is if the US economy as a whole enters a severe and prolonged recession/depression. In my view that will not happen and FED will instead make inflation go skyhigh so that growth persists however artificial. Residential housing prices may go down but at most 5% in the short term before appreciating again due to inflation. I appreciate the analysis. It is nice to have a look at an example of real world rates and the subsequent price movements. I wish I had the time to review a case study in multiple cities because each would provide a different story, but I wanted to make the point that rising interest rates would be negative for the real estate market as a whole - not that it is the only factor involved with price movement in the future. If you also factor in what I believe will be next leg down in our current depression (which I believe began in December 2007) after our current cyclical recovery (which is completely artificial and due solely to Fed intervention, government spending, and the relaxation of bank accounting rules put in place in March 2009) then the outlook for real estate becomes far more troublesome. If you then factor in the pent up shadow inventory still being held off the market by banks then the outlook becomes catastrophic. Will there be certain cities that weather the next downturn and even see prices rise during this period (think Williston, ND)? Absolutely. If you think we are at the start of a new period of job growth and income growth ahead that can be created by the Federal Reserve with a printing press then I would strongly recommend purchasing a home. If you believe the current recovery is artificial then I believe patience will be rewarded. Unfortunately in the market I live in renting is more expensive then actually owning. I sold my house and cashed out, but I have been getting killed in rent. Have decided to buy condo as investment - $700 a month cheaper to live in then to keep renting, when interest rates go up and house prices go down, I will look to buy a house and I will keep the condo as a rental property. I like you analysis of the world and the financial markets, you make complete sense to me, but it is strange how so many people don't see what you and I see. I have been ridiculed by many who thought I was crazy to sell my house and downsize to a condo.